Grand Old Flag [E1820] - $13.00 : Yarn Tree, Your wholesale source for cross stitch supplies. 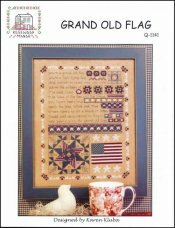 Quilt blocks and a patriotic song were the inspiration for this design, a cross stitch pattern by Rosewood Manor. Stitch count 157 x 213.